I am very glad to receive and post here some very useful tips from Rafe Arnott of Vancouver, BC Canada which would be beneficial for those who are upgrading their decks. Just wanted to say thanks for your reference-quality hardware that I purchased. 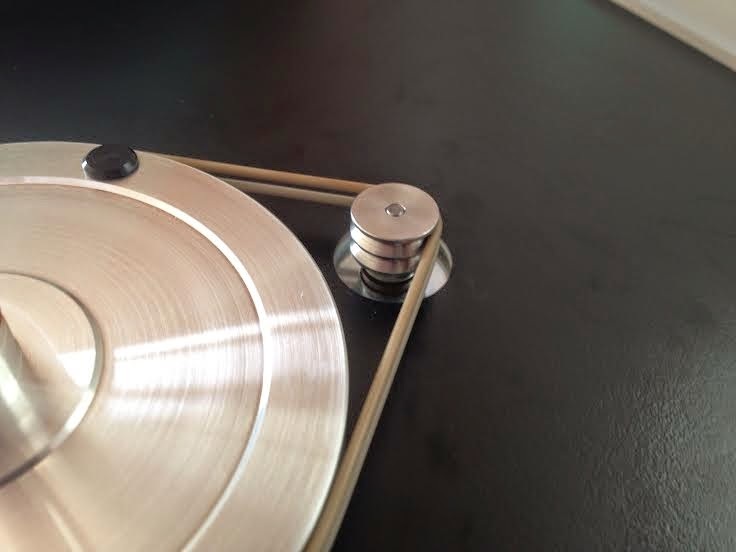 After a bit of confusion regarding the necessity to trim the thrust-bearing spring for proper tension pressure, I'm very happy to say my Rega RP1 is sounding its best yet. My 33.3 stainless steel dual-belt pulley, twin silicone belts and motor thrust bearing arrived a couple of days ago, but I finally had time today to undertake the upgrades. 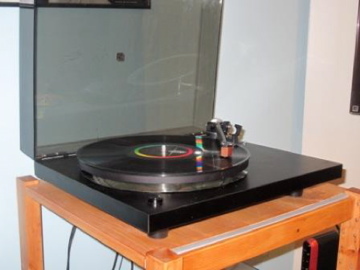 I had already swapped the stock cart - an Ortofon OM5E for a 2M Red, and replaced the 'Bakelite' platter for a Rega glass one. Two upgrades that yielded huge sonic improvements, so I was pretty stoked at how noticeable the improvement was after installing your gear. The clarity and separation of highs, mid-range depth, an expanded soundstage and punchier, tighter bass response were just a few differences I immediately heard. I've only had a chance to spin two albums today since completing the mods, so I'm looking forward to hearing a lot more detail revealed in my LPs over the months to come. Since I modified my TT in a different way than I've seen mentioned on your blog, and because I found there to be a few details lacking mention in any previous posts on your site, I thought I'd send along a few pics and notes that might be helpful for other TT mod newbies and future customers. 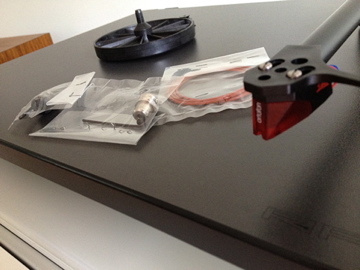 The first image (above) shows the gear as it arrived. The second (below) shows the TT flipped over, tonearm secured, and supported by a few soft pillows while I removed the motor cover in preparation for the thrust bearing. 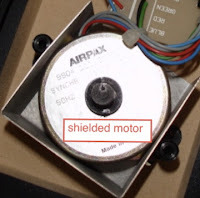 The third image (below) shows the motor exposed and the cover removed; HINT - you only need to remove one screw all the way, as the cover can slide out either way if one screw is removed and the other loosened slightly. Putting on the thrust bearing is very straightforward once the motor housing is removed, it simply snaps into place (IMPORTANT NOTE: Prepping the thrust bearing properly is essential. I added a few drops of high-quality lubricating oil to the bearing after placing it on the spring only to find my motor now making a very audible noise upon application of the bearing - the trick is to TRIM THE BOTTOM (or angled end) OF THE SPRING between one-and-a-half and two coils with small wire cutters. I found this info nowhere, and only after emailing Michael was I appraised of this. Needless to say I was relieved when I was told of this key step! C) (fourth image, below)and drilled out the housing for the thrust bearing to poke through, thus keeping the motor properly secured and not exposed. TIP: To properly mark where to drill, I covered the mounted thrust bearing with a bit of scotch tape and daubed a touch of red children's paint on it. Then I aligned the motor housing. 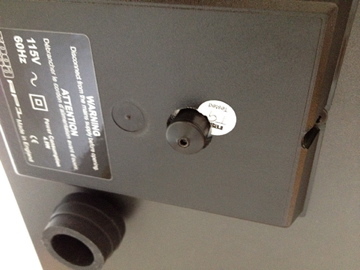 The paint on the tape accurately marking the inside of the housing, pinpointing exactly where to drill. The fifth image shows everything back together. 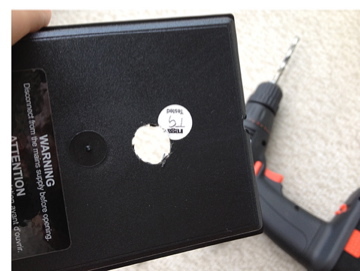 With a little sanding I smoothed out the drill hole, and after cleaning up the cover; voila! A nice, neat solution. The first image shows the stock Rega plastic two-speed pulley removed, (I used a few drops of isopropyl alcohol to loosen the glue attaching it, and let it sit 10 mins. The pulley then came off no problem). Following the advice of a previous poster, I made a shim to help me eyeball how low to mount the the new stainless pulley. (You want to keep the lower belt from being too close to the very bottom of the sub-platter). 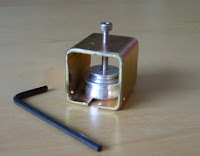 I used a q-tip to apply a sheen of light lubricating oil to the spindle shaft and then attached the pulley with a moderate half- twist to the Allen bolt. I then carefully attached my new dual silicone belts, making sure not to stretch them, and that they were properly aligned. 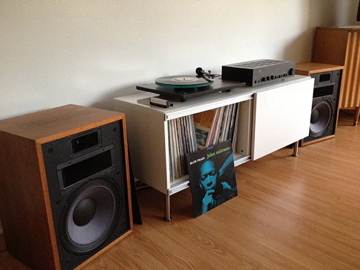 I 'm currently running the RP1 into a Rega Fono Mini, a NAD 3020 and a pair of Heresy II's. 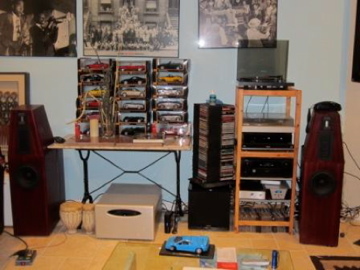 Many thanks Michael, I look forward to purchasing more of your reference-quality upgrades in the near future and enjoying them for years to come. Thanks, Rafe for sharing your tips and pictures with us! Very often this humming is caused by the electro-magnetic field. 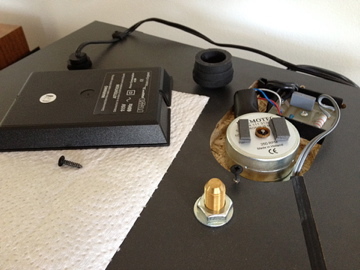 That's why expensive TT's (like Rega P9 TT) often come with magnetic shield(Mu-metal) for the motor. Other than Mu-metal, Ultraperm 80 is another good alternative for the same purpose. "Some kind of electro-magnetic shielding may help ...." I suggested to him. Darel immediately got hold of some electro-magnetic shielding foil and promised to come back with the results! Can you spot the electro-magnetic shield? The shielding is effective, however it did not work very well wrapping the motor itself. I ended up putting the foil between the plinth and the pulley. The foil diameter was about the same as the platter diameter. If you can figure out a way to incorporate it into your base, let me know. The rumble reduction was incredible. From what I understand the 24v motors have more emf magnetism than the 110v motors. It appears that shielding the 110v motors is the way to go with your base. I'M VERY HAPPY WITH THE RESULT!! 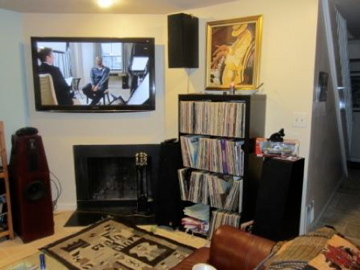 Thanks Darel for sharing these beautiful pictures and info with us! 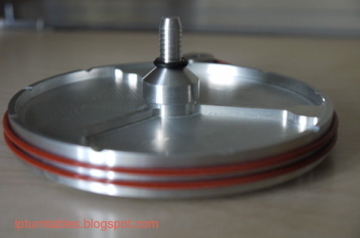 This shorter version dual stainless steel pulley (33.3/33.3rpm) is suitable for P3-24, P5/P25, RP3/RP6. 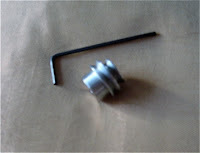 Just remove the "old" pulley with a pulley puller and this pulley will fit nicely without any further modification. 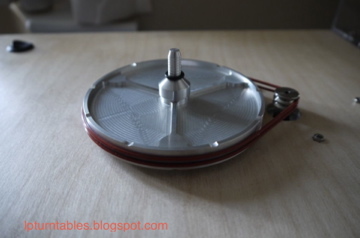 If your TT does not come with a TTPSU and you do wish to play 45rpm records at times, then the following shorter version of standard (33.3/45rpm) stainless steel pulley would be a good upgrade for your stock plastic or aluminium pulley. You may even keep both the pulleys and it's easy to change them back and forth - using grub screw. No messy glue involved! 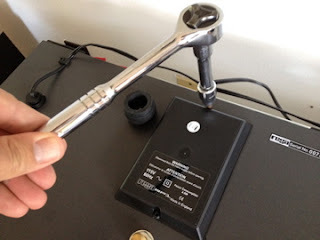 Additional note: It is advisable to remove the stock aluminium pulley (P3-24, P3-2000, P5 TT and for 110V and 24V upgraded motors) with a pulley puller. Got the pulley,puller and belts.Installed great instructions made it a snap-thanks.Love the improvement everything improved ! 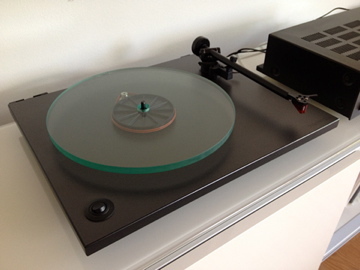 I also changed the feet on my RP-6 to Golden Sound ceramic cones.Impedance is better using with my Neuance shelf. The international post to the UK was very quick and no import duty to pay! I've installed the pulley today and it was very easy to do. I did not need to remove the motor from the plinth because there was sufficient room to get the pulley puller in between the existing pulley and the plinth. 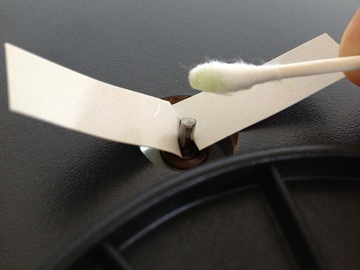 With a couple of drops of acetone and your pulley puller, the original pulley came off very easily. Your new pulley was installed and everything in-place within 15 minutes. Very pleased with ther results and the sound improvements. I've attached a photo. I have received and installed the dual pulley on my P3-24. The install went well with the aid of the pulley tool, just under ten minutes. I have also installed the aluminum sub-platter and feet. I had installed the sub-platter (by others) three months ago. The music was improved on but not focuses. Once I added your dual pulley upgrade the detail to the sound stage became music once again. The music is more transient, timing is outstanding and the sonic imaging if off the hook. Miles Davis…. The music speaks for itself! Well you sure were "spot on" about the improvement that just the SS pulley and two silicon belts would make! I’m also happy to report that your double pulley upgrade has done exactly what I had hoped for. Gone is the shudder on start up, and speed stability is much improved. I always thought the deck played slightly too fast as well and it seems to have corrected that. Everything sounds much more natural now and the music seems to have more space to “breathe” which has the benefit of making it much easier to listen to. Thanks again for the prompt delivery and great service – I look forward to ordering from you again in the future. Hi Michael, just to say that I received my pulley yesterday and have now fitted. A quality product and just what I needed, thanks. No customs charges a bonus too. Just upgraded to the double pulley today with 2x white Rega belts on my NAD 533 and WOW that made a difference! Wow and Flutter is gone. It was more noticeable in acoustic recordings. I just installed a dual pulley and silicon belts on my Planar 2 to complement my other modifications. The parts are well made and my platter starts up much more quickly. A definite improvement over the stock parts. I recommend Michael Lim's dual pulley, and also the cork-rubber mat. The pulley works a treat -- fast start-up and very stable operation -- and the mat looks and sounds great. Also, he's very helpful in giving installation advice and solving any problems you might encounter. 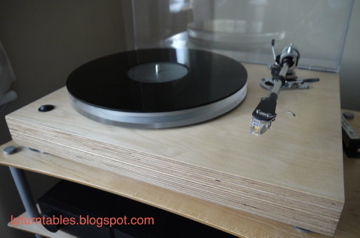 "Take your humble Planar TT to an altogether higher level ... "
As promised I am writing to let you know how I got on installing the double pulley and sub platter on my (Rega based) turntable. Your parcel arrived yesterday morning (Monday) which was surprisingly quick being only around a week from when you posted it. I was then able to install on my turntable in the afternoon. It was relatively easy. The most difficult part of the operation was separating the motor from the plinth. 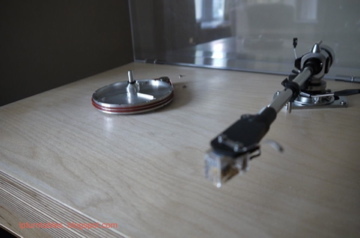 Although it is held on with two nuts and bolts, it still used the Rega sticky pad which is normally the only method of fixing to the Planar plinth. However, with a little persuasion it came away without too much difficulty. 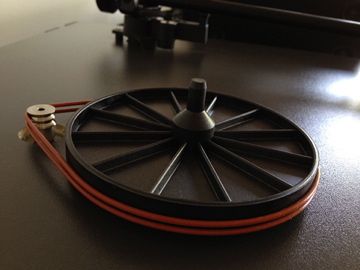 The plastic pulley came away from the motor spindle very easily, without the need for the puller. Installing the new pulley on to the motor (a primotec) was quite straightforward and re-installing the motor on to the plinth was very easy using the two bolts. I think also, because it is not a standard Planar plinth, there was plenty of room to line up the double pulley with the sub platter. I noticed from various letters on the web site that some people had difficulty in placing the pulley low enough to enable the two belts to fit comfortably around the sub platter. However, I had no such problems and installation was completed very quickly and easily. It was now time to see and hear how it all worked together. The answer is that it is very impressive. The start up time is now slashed to around 2 seconds. Everything about the sound is now far smoother and refined with surprising amounts of extra detail coming through. Bass is definitely firmer. There is more space around individual instruments and vocals have far more presence. I thought it was quite good beforehand, but now it is noticeably better. I was a little worried about the double belt causing extra noise to be transmitted, but it is simply not the case. The whole thing is totally silent and the silences between tracks are now quieter and blacker than before. 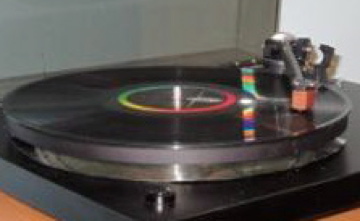 This is what seems to allow the extra detail to come though from the record very effectively. I have attached some pictures showing the installation. Please feel free to use them and any of my comments as you wish. Many thanks, Michael, you have something here that takes a humble Rega Planar to an altogether higher level at a very reasonable cost. I believe that the combination of the new plinth made by a company here called Inspire HiFi together with your new sub platter and double pulley produce a turntable which you would have to spend an awful lot more money to significantly improve upon. Once again, many thanks and I must say that it has been a pleasure to deal with you. Thank you Roger for sharing your experience with us!